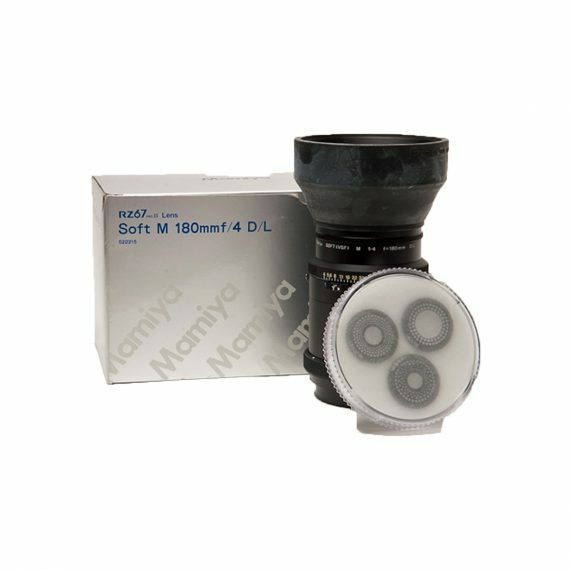 Mamiya Soft M 180mm f/4 Lens for RZ67 | Beau Photo Supplies Inc. The 180mm f/4 VSF lens is a compact mid range telephoto lens. It yields a good camera to subject distance, slight flattening of portrait subjects, and exceptional sharpness. The unique optical design essentially has an “optically correct center,” which can produce a sharp image virtually equal to a standard 180mm lens, when an aperture of f/8 or smaller is used. The edges of the lens elements are designed to induce “spherical aberration,” which creates a dreamy, soft focus effect when the lens is used at apertures wider than f/8. Unlike common soft focus attachments that simply degrade a sharp image, the RZ 180mm VSF can “build” a soft focus image using its unique combination of spherical aberration and diffusion disks. The result is tremendous creative control for effect from dramatic to subtle. Three supplementary disks are supplied with the lens, and fit internally in the lens barrel. The three disks are labeled No.1 (5), No.2(5.6) and No.3 (6.3). The numbers in parentheses are the approximate f/stops to which the lens diaphragm, when set to f/4, is modified. The disks, numbered one, two and three, have different diameter holes in the center, surrounded by numerous smaller holes extending toward the edges of the disks. These small holes act like multiple diaphragms, overlaying softer images on top of the sharp image projected through the center hole. The overall level of sharpness is controlled by the diaphragm opening and choice of disk and whether or not a disk is used at all.